Detailing the physical features, habits, territorial reach and other identifying qualities of the Rosy Apple Aphid. The delicate and rosy-pink bodies of tiny Rosy Apple Aphids belie their combined destructive nature to one of autumn's best-loved fruits. 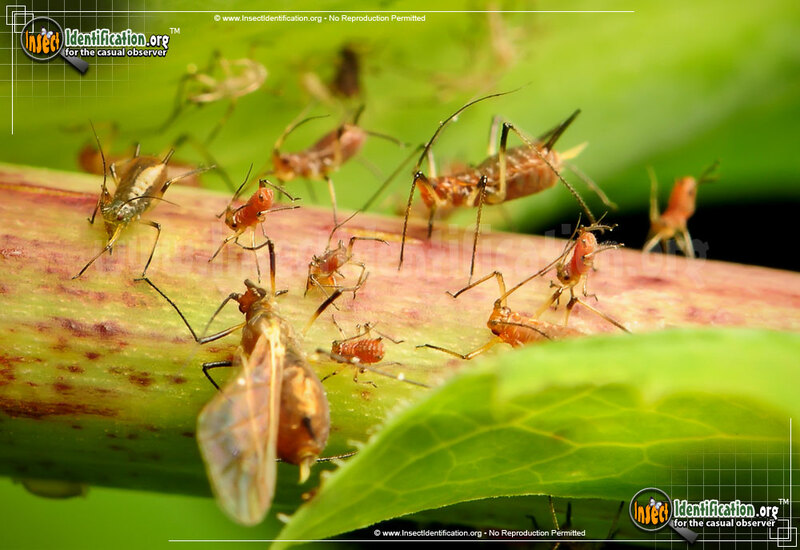 Rosy Apple Aphids are a huge pest in apple orchards and plantain farms. Their juice-sucking activity on the fruit trees both shrivel leaves and deform fruit. Orchard farmers lose some of their profits because blemished fruit does not sell well at the market. The aphid's small size makes seeing them difficult, but the effects of their feeding habits leave visible marks like curling leaves. Groups of aphids hide inside the curled leaf, making it difficult to reach them with insecticide. Rosy Apple Aphids change color and shape as they age. Pale green eggs are laid on the tree and branches, and these eggs turn black as they age. Once hatched, the nymphs grow and change colors as they mature. Since many aphids in different life stages congregate on the same parts of a tree, a cluster of them may display a mix of brown, purple, red, pink, and green individuals. Some adults are winged making it easy to travel to other trees; some are wingless. Some look like they are coated in powder or a white dust; others are clean. Body shape varies from a teardrop shape to a tube or capsule shape. Reproduction can be sexual as well as asexual, and it takes little time for a new generation to join existing ones. Winged females lay eggs in bark in autumn and they overwinter. Wingless aphids reproduce asexually in the spring, getting an early feeding start on budding branches. This insect is one of many threats that face apple orchards. Natural predators exist, but if young aphids are not controlled early in the growing season, the effect of natural predators may not come quickly enough to spare fruit.